The EZ Up tent is one of the most popular canopies used at craft shows. When I was in the market to buy my portable canopy, I did a lot of research and finally narrowed my choices down to either an E-Z Up tent or a Caravan Canopy. Many professional craft artists say they like the EZ Up because it really does live up to its name in that it is very easy to put up. With a bit of practice you can even put it up by yourself (which is very helpful if you don't have someone to help you at your craft shows). They pack up compactly and normally come with a roller bag (check the description before you buy to ensure yours has a roller bag), which makes it easy to transport. Standard craft show booth dimensions are 10x10, so a 10x10 canopy will allow you to make the most of your space in most situations. Most E-Z Up tent models have straight legs, but a few have splayed legs. Tents with splayed legs may measure 10x10 at the base, but because the legs angle in at the top, the top of the canopy is smaller than 10x10. That means, if you intend to keep all of your items under the canopy, you will not be able to make full use of the space you are provided at craft shows. Plus, splayed legs don't work well with sidewalls, and it's harder to create display options along the walls of your tent if the legs are angled in. In a standard 10x10 booth, space is at a premium, so you don't want a foundational part of your display (your tent) to limit your use of the space. A white canopy tent is generally ideal for craft shows. Any other color can impact the appearance of your items under the tent and can make your display appear quite dark and unappealing. Plus, some craft shows require you to use a white tent; other colors are not allowed. Zippered side walls can be a life saver in rainy conditions, and they can provide much needed shade on very sunny days. Side walls can also enhance the look of your display, blocking out views into neighboring tents. A side wall placed at the back of your craft tent can help you to hide any mess (i.e. your lunch cooler, tool box, change of clothes, and all the other necessities you bring to a craft show) from customers walking behind your booth. Four walls can also provide you with the freedom to leave some of your large display items (like tables) overnight if you'd rather not pack up everything on multi-day shows. Some tent packages come with sidewalls included, others do not. When choosing your tent, be sure to read the description carefully, so you know exactly what you are getting for the money. The better models of canopy tents are heavier, so a wheeled carrying case will allow you to easily transport your EZ Up instant shelter from your vehicle to your booth location. It will also protect your tent and prevent it from getting dirty when it is being stored or transported. People who use EZ Up tents generally report that they are very happy with this brand. The one concern some people have mentioned is that the carrying case sometimes does not stand up to repeated use. So, you may want to do your best to be gentle with your carrying case. 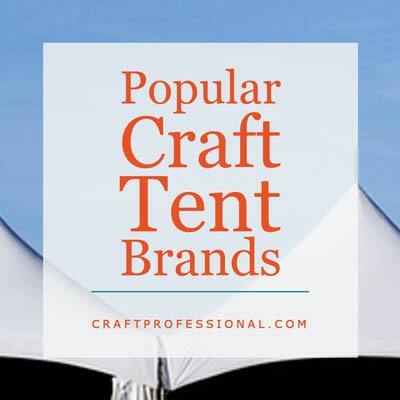 While EZ Up tents are very commonly used by professional craft artists in the United States, it can be difficult to find this brand outside of the US. In fact, after doing a lot of research on canvas canopies for craft shows, I was ready to buy an EZ Up tent. However, I live in Canada, and I quickly discovered that I could not find EZ Up tents for sale in Canada, and the duty charges to import one from the US were quite high. For anyone who lives in a country where EZ Up tents can't easily be purchased, I'd recommend looking at the Caravan Canopy (which is what I have). They are very comparable to EZ Up tents, and they are widely available in Canada. If you choose to buy an Ez Up canopy, do read the specifications carefully to ensure you are getting a real EZ Up tent. Some people who sell cheaper brands try to piggyback on the EZ Up name by calling their tents "EZ to set up" or "Easy Up tent" but they are not actually EZ Ups. Read carefully to ensure you are getting what you want. Although I buy the vast majority of my business supplies online, when I was buying my craft canopy, I initially assumed that the shipping fees would make it unreasonable to buy my canopy online. I was wrong. I live in a small town that is an hour's drive from any stores that might sell craft canopies. Once I factored in the price of gas for the round trip to those stores (not to mention the travel time), the shipping fees ended up being comparable to the price of gas for me to make the trip myself. So, depending on your location, buying your EZ Up tent online, may be a cost effective option for you. Amazon has a good selection of EZ Up Tents at competitive prices and with free shipping. 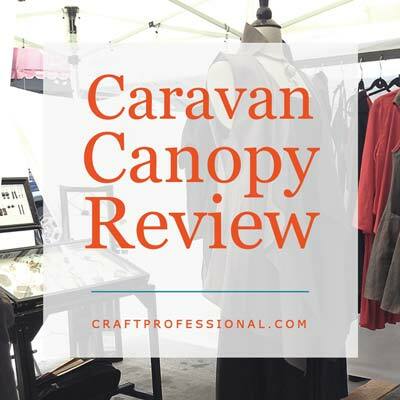 Here's why I bought a Caravan Canopy for my craft booth. Check out these popular portable canopy brands. 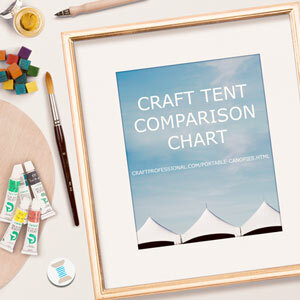 Help comparing craft tents so you can choose the right canopy for your needs.